The Housing Bust: Signs of a Bottoming Out? 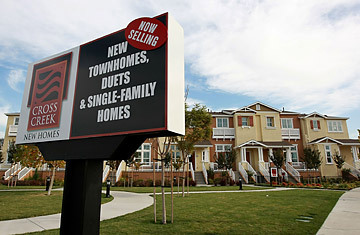 A row of new homes at a housing development in Hayward, Calif.
How Bad Will the Mortgage Crisis Get? The last piece of the last residential construction crane in Miami is coming down this week. Don't expect to see another crane in this city for a decade, says Peter Zalewski, a real estate broker and founder of Condo Vultures, a realty intelligence service. Miami is both a metaphor and model for once torrid real estate markets that melted in the subprime debacle. Miami developers threw up some 23,000 units beginning in 2003, many of them bought by speculators who thought they could flip them for a quick profit. Some did. Then the music stopped. "Our best guestimate  and we've talked to lenders and developers  is that you will not see a residential construction crane in the sky in downtown Miami for a generation," Zalewski told TIME. "Well, at least seven years," he said before modifying his forecast yet again. "Let's go with a decade," he finally concluded. Let's. The latest Case-Shiller Home Price Index for a 20-city composite showed that prices recorded a 1% drop in August and were down 16.6% for the past 12 months. Miami had a 1.8% monthly drop and a 28.1% tumble over the past year; in San Francisco, it was -3.5% monthly and -27.3% for the year. Yet there are nascent signs of a bottoming out. The rate of sales decline slowed in August, according to Case-Shiller, and in September existing home sales rose 5.5% nationally, which means buyers are finally being lured to the market by low prices. The big question: Will a recession that is gaining momentum break through housing's floor again? In other words, Is this real estate's dead-cat bounce? In Los Angeles (and even in Miami), there is evidence that the housing market is lifting its head off the deck, even as foreclosures continue to pile up and prices edge downward. Properties are at least moving again there, many at 30% to 40% off even last year's lowered prices. "In Los Angeles, one year ago, the median home price was $582,450; this September, it was $376,790," says Leslie Appleton-Young, chief economist for the California Association of Realtors. That may sound awful, particularly if you're the seller, but it may represent a clearance level  i.e., prices low enough to draw buyers  which the market needs in order to stabilize. Other helpful factors: banks are agreeing to short sales  i.e., selling below the mortgage amount  and renegotiating some mortgages. Still, foreclosures in the Los Angeles area are up 122% over last year, according to RealtyTrac, which publishes a database of foreclosed properties. Oddly enough, though, talk of the Federal Government's possible mortgage bailout is beginning to slow things down. In Los Angeles, it has plugged the deal flow, because banks are now less willing to work things out since they suspect that Uncle Sam may offer better mortgage buyouts. "Recently, a lot of the financial institutions have stopped accepting short sales to find out if the government is going to buy their loans that are in default. They're waiting to see what happens with the recent rescue plan to buy back mortgages," says Fred Arnold, president of the California Association of Mortgage Brokers. In Miami, banks and distressed homeowners can't wait to throw underwater mortgages into the government's pool. Says Zalewski: "I can see the Federal Government giving them a mulligan and allowing them to sort of a do-over."